It isn’t often that a market measure simultaneously shrinks in quantity and gains in importance, but that is the case for crude oil imports into Gulf refineries this year. Six to nine months ago, traders were predicting the end of imports, and signaling a declining interest in how much foreign crude is still making it into the US. The indifference has turned into keen interest as two trends emerge: A far from smooth decline in total volumes, and a rising correlation between imports and PADD 3 storage. In today’s blog, we examine these developments and their implications for the market. RBN has covered the flood of domestic crude oil showing up at Gulf Coast refineries in a number of blog posts this year (see Texas Bound and Flyin’). Market attention has turned to the Gulf Coast region – home to half the nation’s refining capacity as new crude delivery infrastructure in the shape of pipelines as well as rail and barge deliveries have overcome a crude logjam in the Midwest. Along the way, the price relationship between three crude benchmarks has altered significantly at the Gulf Coast, namely the US domestic light sweet crude benchmark price for West Texas Intermediate (WTI) set at Cushing, OK, the international light crude benchmark, Brent and the Gulf Coast light sweet benchmark Light Louisiana Sweet (LLS). With the Gulf Coast now awash in domestic light crude production, LLS and WTI prices are set by domestic supply pressures while lower imports of light crude at the Gulf Coast have reduced the influence of Brent since the fall of 2013 (see You Can Call Me Queen Brent). Total imports of crude oil to the Gulf Coast region defined as “PADD3” by the Energy Information Administration (EIA) have declined overall during the past year although the weekly data has been quite volatile (see Figure #1). We expect Gulf Coast refiners to increase their consumption of domestic crude versus imports but the equation is complicated by a quality mismatch between lighter crude production from shale and refineries designed to process heavier crude. As refiners adapt to new supply and quality patterns as well as new delivery infrastructure, changes in import patterns can be hard to discern or interpret. In this blog post we discuss changes to indicators based on crude imports traditionally used by traders to anticipate price movements. ONLY THREE DAYS LEFT FOR THE EARLY BIRD RATE! Why are refineries limited in the portion of light crude that can be run? 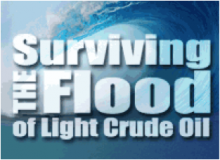 What are the current limits on light crude runs? These questions and many more will be addressed at this conference, to be held August 19-20 in Houston. Register Now. We look first at the changing source of crude supplies. Back in 2012, refiners on the Gulf Coast supplemented their steady diet of imported foreign crude grades with then unfamiliar new domestic shale production that was primarily arriving by barge and tanker. In 2013 the reversal of the Cushing, OK to Houston, TX Seaway pipeline, increased pipe and waterborne deliveries from the Eagle Ford, and rail deliveries from North Dakota to St. James, LA, together pushed out the need for light crude imports. That left a base load of medium and heavy grades being imported at the Gulf Coast. During 2014 so far, the medium and heavy base load held its own through the first quarter and then started seriously eroding in April. The decline has accelerated since. Now, instead of supplementing imports with domestic grades, refiners are doing the opposite. Domestic grades have become the base-load, and foreign grades are the supplements. These changes have altered crude relationships so that domestic crudes such as WTI and LLS set prices at the Gulf Coast while international crudes such as Brent have less influence (although Brent still sets the price of crude on the Atlantic Coast). To access the remainder of Turn, Turn, Turn – New Patterns of Gulf Coast Crude Oil Flows you must be logged as a RBN Backstage Pass™ subscriber.